Cardinals players once offered to defer payments on their salaries in order to help management find the money to sign free-agent pitcher Greg Maddux. Despite mutual interest between Maddux and the Cardinals, a deal couldn’t be reached. 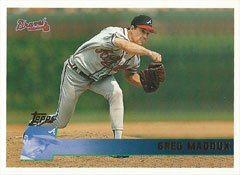 Instead, Maddux signed with the Cubs in February 2004. Elected to the National Baseball Hall of Fame by the Baseball Writers Association of America on Jan. 8, 2014, Maddux earned 355 wins, four Cy Young Award trophies and 18 Gold Glove honors in a 23-year big-league career with the Cubs, Braves, Dodgers and Padres. After the 2003 season, when Maddux left the Braves and became a free agent, he was among the pitchers the Cardinals pursued. In 2003, St. Louis snapped a streak of three consecutive years in the playoffs. The problem was lack of quality pitching. After the season, general manager Walt Jocketty strengthened the staff by acquiring pitchers Jason Marquis, Ray King and Adam Wainwright from the Braves and signing free agents Jeff Suppan and Julian Tavarez. King and Tavarez bolstered the bullpen. Marquis and Suppan joined Matt Morris and Woody Williams in the starting rotation. The Cardinals were hopeful Chris Carpenter, who sat out the 2003 season because of an injury, could become the fifth starter in 2004. Maddux offered an enticing option. Though 37, he remained effective. He won 16 for the Braves in 2003, his 16th consecutive season with at least 15 wins. Jocketty met with Scott Boras, the agent representing Maddux, on Dec. 12, 2003, and spoke by phone with him three days later, Joe Strauss of the St. Louis Post-Dispatch reported. Jocketty “refused to rule the Cardinals out” of the bidding for Maddux, Strauss wrote. In early February 2004, Morris told his hometown newspaper in Middletown, N.Y., he called Jocketty and offered to “take less money this season” if the Cardinals signed Maddux, reported Rick Hummel of the Post-Dispatch. On Feb. 8, 2004, in a column headlined “Ownership Must Listen to Players’ Pitch for Maddux,” Bernie Miklasz of the Post-Dispatch revealed Jim Edmonds, Jason Isringhausen and Scott Rolen had joined Morris in offering to restructure their 2004 contracts to provide the Cardinals money within their budget to sign Maddux. Just before spring training began, though, Maddux accepted the Cubs’ offer of a three-year contract for $24 million. In the end, the Cardinals prevailed. Maddux was 16-11 in 33 starts for the 2004 Cubs. Morris, Williams, Marquis, Suppan and Carpenter all posted double-digit wins for the 2004 Cardinals. St. Louis had the best record in the National League at 105-57 and finished 16 games ahead of the third-place Cubs.